What to do with all that squash! A common question that we get from CSA members after a few weeks of fall squash distribution. And I understand. Sometimes I can look at a pile of uncooked/unprocessed veggies… like squash… and feel at a loss, too. Ugh! I only have so much time and creativity! So one thing that helps me a ton is to just get the stuff cooked and into the fridge. Yes! Having a fridge full of cooked veggies is like gold to me. Because when mealtime rolls around I can quickly prep up a veggie dish rather than completely starting from scratch. And one of the veggies I like to have cooked and in my fridge the MOST is winter squash. Winter squash, any kind really, is a versatile veggie that shines in so many ways in the kitchen. Especially when you cook it this easy way. I literally cook ALMOST ALL my squash like this because it is so easy and forgiving and I just want it for its flesh anyway. Cut your squash in half lengthwise. Lay facedown in a baking dish. Roast at 375-400 until a knife easily pierces through the flesh. Remove from oven, drain off water, turn right side up, and let cool. Scoop out flesh from skin. Store in a lidded container in the fridge until ready to use. *If you’re going to serve it straight from the oven you could skip the water part of this recipe, and instead grease your baking pan. Cook your squash using the easy method above, remove the flesh, and let cool. Put your squash flesh into a freezer container of your choice (freezer bags or plastic containers work well). To use, simply thaw out your squash flesh and use in any of the recipes above or your own! Here are our family favorites! These recipes are ones we make all the time during winter squash season... fall into the winter. Check them out below and you'll see how having the cooked squash in the fridge enables making these recipes SO much easier! This is our favorite, go-to squash soup recipe. I know it by heart. I make it that often. Heat the butter in a 4 quart pot and sauté the onion, stirring frequently. When the onion is soft, add the curry powder and stir for 30 seconds. Add the coconut milk and chicken stock and bring to a boil. Reduce heat to a simmer. Scoop the flesh out of the cooked Delicata skins and add it to the soup. Stir or blend it in, salt to taste and serve. This is a surprisingly elegant casserole perfect for guests as well as causal dinners with your family. Makes a delicious twist on plain squash! Once you learn the consistency you like to make these pancakes, they’re easy and delicious for breakfasts! Thinner batter and smaller pancakes yield a crispier result, whereas thicker batter and larger pancakes make for a fluffier outcome. These are Farmer Gene's specialty breakfast item during squash season. Mix or blend together squash, nut butter, and eggs at a ratio of 1 cup squash, 1/4 cup nut butter, and 1-3 eggs. Then add salt and pepper to taste. You will need more eggs when using a dry squash like buttercup than when using a moister squash like Delicata. You want a pancake batter consistency that is liquid enough to pour. Not a thick batter that plops off a spoon. Heat oil in a skillet or griddle over medium heat and spoon on the batter in 1-2 TBLS amounts. Cook for a couple minutes per side until golden brown. Serve with butter and sour cream for a savory option or maple syrup for a sweet treat! 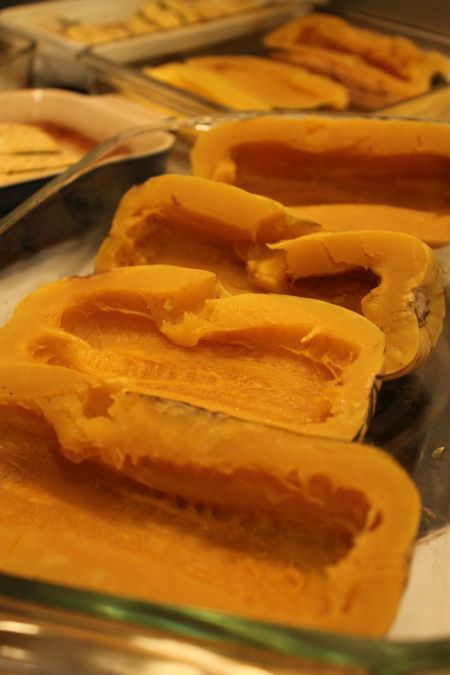 What are your favorite recipes for cooked winter squash? I’m curious, so please hit reply and let me know!